From the moment the kettle boils and the sound of boiling water fills your ears, you are relaxed and yet excited to taste this treat of a tea. Already you will have opened the packet and the waft of perfectly blended spices and herbs bring a smile to your face. The anticipation, as with any of the amazing teas from Mad Hatter, builds up as you spoon the leaves into your warmed and waiting teapot. With a click or a whistle, the kettle boils and the sound of the hot water rushes over the leaves. The hint of an aroma drifts up through your nostrils and you sigh with absolute joy. “What is it you can smell?” you ask yourself. Is it the rawness of cinnamon, the freshness of apple, the zest of ripe orange or is it something else? All you know is that it smells divine and this triggers your taste buds even before your first sip. Letting the teapot sit, you kick off your shoes, find the perfect tea cup or your favourite mug and get ready to relax. 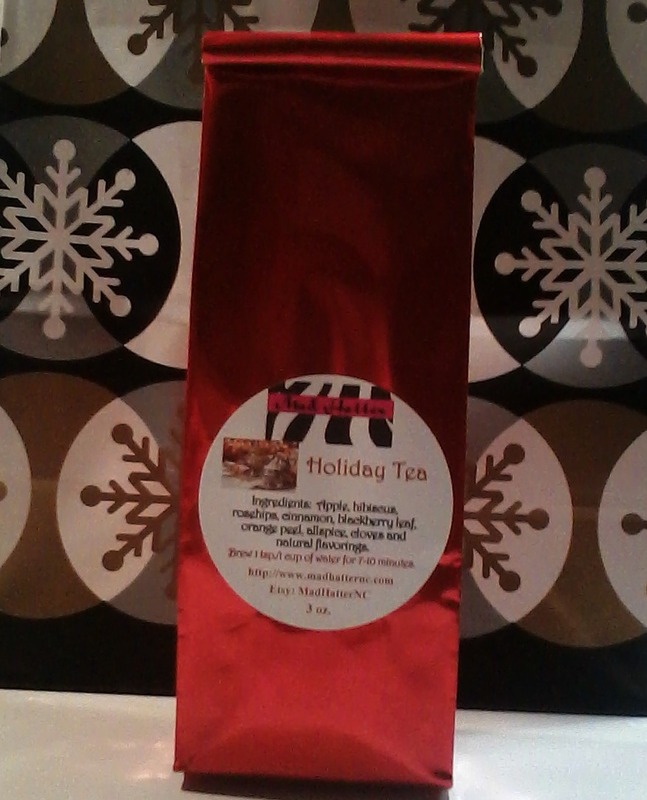 The aroma of this amazing new holiday tea entices you to switch off the busy world outside and the rush that so easily becomes what Christmas is all about, and just find peace. You carry the teapot and your cup to your table or favorite chair by the fireside. Placing them down you lift the lid off the teapot for one last stir. The joyful fragrance you smelled as you poured the water on the leaves has now intensified, and dances in your mind. It is now time to sit back and enjoy. Sitting down you pour your first cup of holiday tea into your cup. Your face beams a content and welcome smile. This is your “me time”, the special time of day you make for yourself to indulge in the finest cup of tea in the land. The fragrant liquid flows and steam rises from your cup. It is a little too hot to drink so you lift up your cup and breathe in the enticing vapour. “Christmas” you say to yourself “Christmas” that is what the aroma of the tea is. Every memory you have ever had of Christmas comes flooding back as you soak in the steam and let your mind relax. Closing your eyes, just for a moment, fills your heart and soul with contentment, the kind only Christmas can do. You wrap your hands tightly around the teacup, pause, and take a delicate sip. The sip you take fills your body with a sensation like never before. Suddenly you realise you have discovered the magic of something truly special. The seasonal blend of apple, hibiscus, rosehips, cinnamon, blackberry leaf, orange peel, allspice, cloves, and sprinkling of other natural flavourings, buzz inside your mouth. A warmth flows through your body you sit back and smile. You have discovered something you perceived as impossible. You have found the magic of Christmas in a cup of wonderful holiday tea. I love drinking tea around the holidays!